When you are looking for the perfect trivet that is sturdy and can withstand higher temperatures, you need look no further than MrsLinsKitchen. 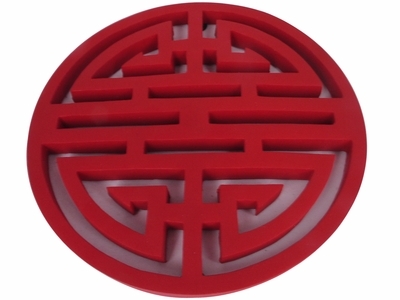 We have found the perfect cast iron trivet that will hold your hot tetsubin pot with no problem. The 5-1/4 Inch Cast Iron Trivet is affordable and made expressly for this purpose. Not only will it add to your presentation, the trivet acts protectively to keep your counter surface or table top safe from burns and scratches. For the perfect cup of tea that is good and warm to the last drop, you will want to consider a cast iron teapot warmer or glass teapot warmer which allows the teapot to stay at the perfect temperature as is heated from below with a tea light candle. Another style of teapot warmer to consider is the Grey Yixing Clay Tea Warmer which is more Chinese in style. We have found these unique complementary accessories that are great additions to prolonging your savory tea time experience from the greatest tea drinking nations in the Far East. Enjoy them for yourself and be sure to order some extra as they make great gifts for tea lovers of all ages.